Authors: P. Lazarus et al. What is your computer doing right now? Your tablet? Your smartphone? Unless you’re reading this astrobite concurrently on all of your devices, chances are at least one of them is idle — its cores yearning for computational endeavors. What if all that processor downtime could instead be utilized to make scientific discoveries? As you may have guessed by my leading questions, it can and it has. The large volume of data that modern scientific projects produce require novel methods for data analysis. Citizen science is one such method, and has shown great utility across many disciplines. Most citizen science projects have volunteers from general public to scrutinize and classify data. In astrophysics, citizen science is used for everything from identifying galaxies from the Sloan Digital Sky Survey, analyzing light curves from Kepler data, or classifying troublesome noise in the LIGO gravitational-wave detectors. However, there is another class of citizen science that doesn’t require a volunteer’s time, but rather a volunteer’s computer’s time. Einstein@Home is one such project, providing free software that uses your computer’s idle time to search for gravitational waves from rotating, asymmetric neutron stars using data from LIGO as well as radio pulsars using data from the Arecibo Observatory. This project uses computational resources from over 50,000 laptops, PCs, and smartphones around the world, totaling in a computing power of 1.7 PetaFlops per second (i.e. 1.7 quadrillion floating point operations per second). This makes Einstein@Home among the 60 largest “supercomputers” in the world! Today’s astrobite discusses a new discovery from this project — the most massive binary system consisting of a radio pulsar with a neutron-star companion. Figure 1. Pulse profile of PSR J1913+1102. 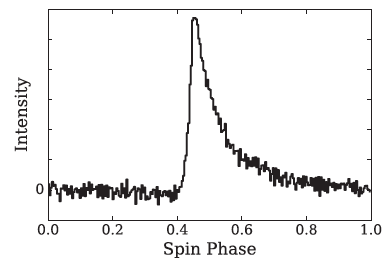 This pulse shows 5.3 hours of data stacked over the rotation period of the pulsar. The exponential decay in the pulse profile is caused by interstellar scattering. Adapted from figure 1 in today’s paper. Figure 2. Animation of a pulsar with a neutron star companion. Gravitational waves emitted by the system are shown as ripples in the spacetime fabric. Courtesy of John Rowe animation. There are also numerous relativistic effects that one can examine from this extreme system, providing a unique testbed for general relativity. One relativistic effect that has already been detected in this system is the advance of periastron. General relativity predicts that the ellipse of a two-body orbit precesses (i.e. the point in space where one body is closest to the focus of the ellipse changes). Observation of this effect in Mercury’s orbit was evidence against Newtonian gravity, and was one thing that caused people like Einstein to rethink gravitational theories of the time. The authors found from pulse timing that the orbit of the system is precessing at about 5.6 degrees per year due to this relativistic effect (as a comparison, the rate of precession of Mercury’s orbit is only 1.5 degrees per century). It turns out that once we know the orbital period and eccentricity, this effect (to first post-Newtonian order) is solely dependent on the total mass of the system, and therefore authors were able to determine the total mass of the system to be almost 2.9 solar masses, making it the most massive system of its kind ever discovered. Though the exact masses of the two individual neutron stars isn’t known, the small eccentricity described above hints that the pulsar is significantly heavier than its neutron-star companion. Using more observations, one can further constrain the masses of the two neutron stars in the system and test other relativistic effects. By the end of 2016, the authors expected to have accumulated enough pulses to allow measurement of the Einstein delay, which accounts for the time dilation from the moving pulsar relative to Earth’s motion and the gravitational redshift caused by the binary companion. This measurement will unveil the individual neutron stars’ masses, testing predictions motivated by the system’s eccentricity on how the neutron stars came to be. Long-term timing will also allow for a precise measurement of the orbital decay due to gravitational-wave emission (as was done with the Hulse-Taylor pulsar to win a Nobel prize). Certainly, this system has much more to offer, and we can thank the hard-working computers that bypass their idle time for making this discovery. If you want to join the effort and contribute to more discoveries, make sure to go to the Einstein@Home website and sign your computer up today! Featured image of today’s astrobite courtesy of John Rowe animation. I’d like to tell this to school students when I go to schools to give popular talks on astronomy. However, my concern is what kind of reward anyone gets if their computer (or time) results in discovery/paper/announcement? It is easy to tell kids to contribute to science et al., provide theor computer time, but what they get for that? Such questions are bound to be asked.